Woodburn Police Department is asking for the public's help in locating two people of interest in a burglary and stolen vehicle report occurring Monday, Jan. 28, at A+ Storage on N. Pacific Highway. Police are investigating the burglary and theft and describe the suspects as being associated with a U-Haul pickup truck with Arizona plate AJ07908. 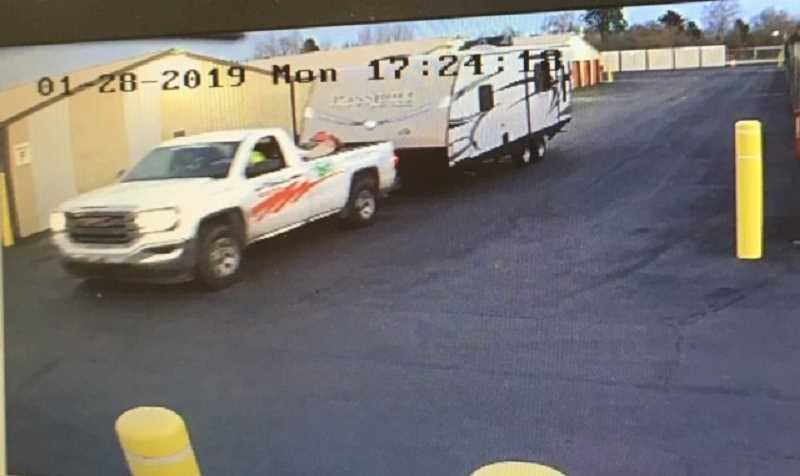 The vehicle reported stolen is a 2016 tan with black markings KYRV make, Passport brand, double-axel, 28-foot travel trailer, with Oregon license plate R875858. One suspect is described as an Hispanic adult male in his late 30s, between 5'6" and 5'8" with a slender build and facial hair. He was last seen wearing a dark ball cap, dark hooded sweatshirt/jacket, a yellow reflective vest, dark pants and dark shoes. The second suspect is described as a white adult male in his 40s, also about 5'8" with a medium build and possible mark on his right cheek. He was last seen wearing a camouflage hat and pants, a yellow reflective jacket, black t-shirt with white lettering and dark boots. Anyone with information is asked to contact Woodburn Police officer Steven Sloan at 503-982-2345.